Called the City of Eternal Spring for its warm ocean waters and relatively mild, rainless climate, Arica, Chile, has become a beach resort for Bolivians and to a lesser degree for Chileans (who prefer Iquique). 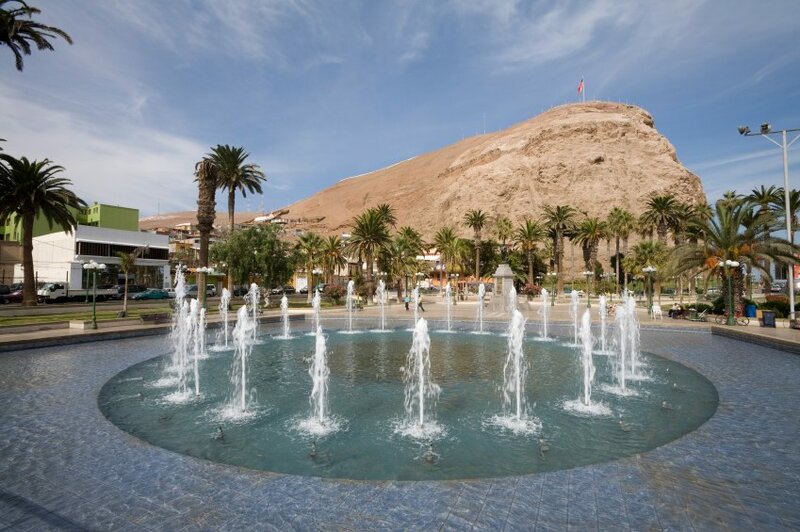 Located on the coast 1,280 mi/2,060 km north of Santiago, almost at the Peruvian border, Arica enjoys sun year-round, though June and July can be a little cool for beachgoers. The steep headland of El Morro, easily climbed from downtown, offers views of the city's palm-studded plaza and desert shoreline. In town, visit the Church of San Marcos, a prefab designed by Gustave Eiffel, and the handicraft village (pueblo artesanal), which sells good knit garments, ceramics, stone carvings and pottery. Arica receives the least amount of rainfall of any city in the Western Hemisphere, and is an excellent jumping-off point for exploring Lauca National Park to the northeast, as well as entering Bolivia or Peru. At nearby San Miguel de Azapa, the archaeological museum's prize possessions are 96 Chinchorro mummies, the world's oldest mummified remains—3,000 years older than those in Egypt. In the high Andean steppes to the east, Lauca National Park is home to the endangered vicuna, a wild relative of the llama and alpaca. Because of the high altitude (upwards of 14,000 ft/4,340 m), day trips are not advisable—it's better to spend a night at the intermediate village of Putre and visit the park the following day.